"After successfully carrying out a highly tricky mission in Istanbul that serves to sabotage Iran's nuclear ambitions, U.S. Army intelligence operative Paul McGrath, the hero of this superior thriller from Grant (the Cooper Devereaux series), receives a letter from his estranged father two years after it was written, thanks to the inefficient military mail system. McGrath's choice of career alienated his father, a pacifist, but the senior McGrath offers hope for the two of them to reconcile in the letter. When McGrath finally reaches the house in Westchester he grew up in, he's stunned to learn that his father has died, apparently from a heart attack, following a heated argument with his shady business partner, Alex Pardew. The circumstances immediately trigger guilt in McGrath over his refusal to be that partner. Things get worse when the NYPD suspect McGrath of being behind his father's death, leading McGrath to turn investigator. Grant capably combines a riveting plot and depth of character. His best outing to date, this standalone marks Grant as a rising genre star." "Paul McGrath is not just a janitor—he's a terrific new hero in what promises to be a fantastic and original series by Grant. Paul may be invisible... but his results are not in this intense mystery thriller that will leave you wanting more. In a word? Awesome." "Invisible is a riveting read from cover to cover. I love getting in on the ground floor of a new series, especially when it's sure to be a hit!" "Invisible is propulsive and engaging from the very first page. Andrew Grant has created a devilishly appealing new protagonist in Paul McGrath—the Janitor—who literally cleans up trouble and defends the defenseless in the most satisfying ways." 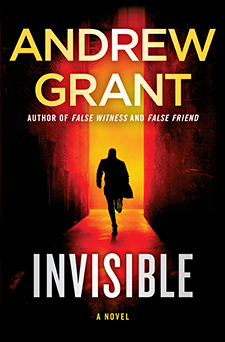 "The masterful Andrew Grant outdoes himself with this deliciously twisty, magnetic thriller. Fiercely redemptive, with its clever, profoundly moving, and altogether captivating David and Goliath hook, Invisible is a winner." "Wonderfully entertaining. Great action. Authentic spy craft. A fascinating new kind of detective, with wit and charm galore. Would that we all had someone like 'the Janitor' to help us." "Invisible is the perfect thriller for these perilous and imperfect times. Buy it. Read it. You won't regret it and you won't forget it."